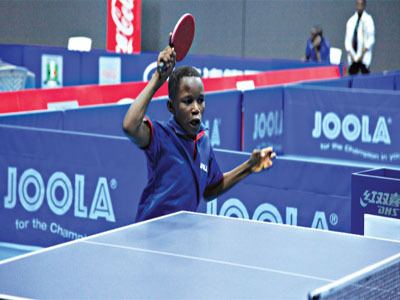 With four gold and three bronze medals, Nigeria finished second behind host, Egypt, at the just concluded ITTF World Junior Circuit (WJC). Egypt topped the table with seven gold, while Slovenia won three gold medals to settle for third spot on the medals’ table. Over 15 countries from Africa, Europe and Asia took part in the one-week championship held at the 6th October Hall in Cairo. Nigeria made the second spot on the final day of the championship with Esther Oribamise, Abayomi Animashaun and Amadi Omeh claiming gold in the cadet and mini cadet events. The star player for Nigeria was Oribamise, who had earlier failed to excel in the junior girls’ event but had to measure up in the cadet girls’ singles when she beat Egypt’s Rolan Hesham 3-0 to clinch the third gold for the West African giant. In the cadet girls’ doubles, Oribamise partnered Tunisia’s Fadwa Garci to beat Egypt’s Roa Amro and Farida Badawy 3-0 to add to her medal haul in Cairo.